Managing your inventory logistics is essential to running a high-functioning operation. Lost or misplaced merchandise can result in unnecessary and otherwise avoidable delays, which can hurt your relationship with customers and end up costing money or even future contracts. Those aren’t the results that you want, and those are not consequences that any business ever desires to experience. Luckily, effective warehouse logistics management can help you prevent those problems while keeping you moving. Most delays and losses can be eliminated with proper structure, design, and planning. After all, it’s no mistake that excellent controls produce superior results. Peosta Warehousing is committed to providing organized facilities that offer our customers a comprehensive, cost-effective host of logistics services—and not just storage space. Thanks to our inventory warehousing solutions, you’ll never be more than a click away from your inventory so you can manage it from anywhere at any time. And thanks to our convenient accessibility from a variety of Midwest transportation hubs like Kansas City, MO, Chicago, IL, Minneapolis, MN, and Milwaukee, WI, your products are never far from their end customer. The goal of our packaging solutions is simple: Minimize your costs of handling. Peosta Warehousing is a warehouse company that offers primary, secondary food, and non-food packaging facilities designed so your product arrives safely and efficiently to the end user. Make your products retail friendly using our custom product display packaging. We specialize in retail-ready packaging so we can help you craft a display package no matter which industry you serve. We use folding cartons, corrugated wraps, telescoping, two-piece, jumbo and automatic erected boxes. Packing your product so it ships safely and securely without taking up tons of cargo or shipping space is a critical function. We use high quality shrink wrap, bundling, packing, and specialty packaging equipment to cost effectively pack your products so they arrive at their destination safe, clean, and tamper-free. If your distribution operation requires product labeling or combining multiple products into new product kits, Peosta Warehousing Logistics’ services are right for you. We have experience assembling promotional kits, multi-packs, club packs, and more. Our labeling and kitting services will allow you to reduce your inventory, respond quickly to customer demands, and even fulfill custom individual orders. The customer experience is just as critical as the activities that bring your products to their point of sale. Peosta Warehousing Logistics integrates reverse logistics into your overall supply chain strategy. Our product return management services will provide you with the entire return, repair, and exchange assistance you need. This will not only improve your product visibility and control, but create faster returns and an increased asset recovery value. Our fleet of 24 trucks and 32 trailers, coupled with our staff of full-time, part-time and seasonal drivers, offer reliable and dependable delivery to meet local and international needs. We coordinate, manage, and monitor freight, including customs clearance, freight forwarding, import and export consulting, and drayage. We are a proud participant of C-TPAT, the Customs-Trade Partnership Against Terrorism, so we consistently focus on the security of our supply chain and your products. Cross docking will allow you to synchronize and plan shipments to save time and money while moving your products from production and to consumers. With the help of our network, you can decrease shipping and handling costs by consolidating your pool shipments. International freight requires the understanding of a host of different rules and regulations, but Peosta Warehousing can ensure your international freight reaches its final destination. We’ll coordinate international imports and exports so your shipments arrive on time, every time. When you need to ship a smaller load, our staff can transport those using our group of reliable trailers. No matter the size, we will find the most efficient way to move your freight. Radio communication between truck drivers, spotters, and warehouse workers allows every truck to be loaded and unloaded efficiently, saving you time and money. Our exceptional primary, secondary food and non-food packaging facilities allows us to customize your packaging needs. Our custom packaging will minimize your costs of handling. Whichever industry you serve, we can help put together your custom product displays. We specialize in retail-ready packaging, folding cartons, corrugated wraps, and telescoping, two-piece, jumbo, and automatic erected boxes. Packaging your products is important and we have the solutions to keep your packaging cost-effective. Our high quality shrink wrap, bundling, packing, gluing supplies and specialty packaging equipment keep your products safe, clean, durable and tamper-resistant. If your distribution operation requires product labeling or combining multiple products into new product kits, Peosta Warehousing Logistics’ services are right for you. We have experience assembling promotional kits, multi-packs, club packs and more. Our labeling and kitting services will allow you to reduce your inventory, respond quickly to customer demands and even fulfill custom individual orders. The customer experience is just as critical as the activities that bring your products to their point of sale. Peosta Warehousing Logistics integrates reverse logistics into your overall supply chain strategy. Our product return management services will provide you with the entire return, repair and exchange assistance you need. This will not only improve your product visibility and control but create faster returns and an increased asset recovery value. We offer reliable and dependable services to meet local and international transportation needs. We coordinate, manage and monitor freight including customer clearance, freight forwarding, import/export consulting, drayage and warehousing. We are a proud participant of C-TPAT, the Customs-Trade Partnership Against Terrorism and consistently focus on the security of our supply chains. Ship your products directly to your customers with our complete fleet of trucks and trailers. Our cross-docking capabilities allow you to synchronize your product shipments. You can reduce material handling, standing inventory, operating and distribution costs and save time while moving your products from production to your customers. We offer pool distribution to transport your product orders to their various destinations. Our budget-friendly approach and flexible network allows you to consolidate your shipments and decrease handling time and shipping costs. At Peosta Warehousing Logistics, we ensure your international freight will arrive at its final destination. We’ll coordinate your imports and exports and work with you, your partners and ours so your shipments arrive on time, every time. Peosta Warehousing Logistics is C-TPAT compliant to make sure your supply chain is secure. Have less than a full load? Peosta Warehousing Logistics can transport your smaller shipments using our group of reliable trailers. No matter the size, we will find the most efficient way to move your freight. Peosta Warehousing Logistics utilizes radio communication and messaging for contact between truck drivers, spotters and warehouse workers so each truck is loaded and unloaded efficiently, saving you time and money. Peosta Warehousing has implemented a secure, state-of-the-art web based warehouse management system that allows you to view your inventories anytime, anywhere. EDI and bar-coding capabilities are included which enables you to organize your resources and optimize your fulfillment and distribution processes. Keep track of everything from start to finish with this exceptional system. 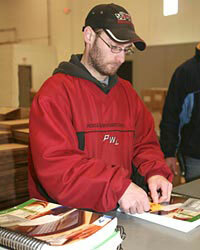 Peosta Warehousing Logistics in Peosta, IA offers local and international logistic solutions for businesses. Our logistic services include packaging as well as transportation. From labeling and kitting to cross docking and pool shipments, we do it all. Our highly motivated and experienced staff enable us to provide 100% customers’ satisfaction. We provide effective warehouse management solutions for your business. Our logistics and warehouse services are among the best in the area. We take full responsibility for the development of a building to suit your specific requirements. Contact us today!